I've been saving frozen juice lids for a few months. I only buy frozen orange juice for backup so it took me a while to accumulate more than twenty. 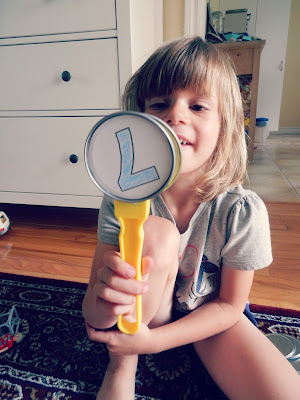 I originally was saving them for some sort of picture game for Kate, but I didn't really have the images readily available, so I decided to use them to help learn numbers instead. I printed off two sets of these numbers in black and white, and colored them with colored pencil one night while watching something on tv. After that I drew circles around them with a small glass and a pencil and then cut them out and used a regular school gluestick to paste them onto the clean lids. 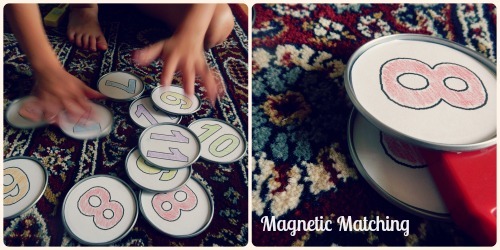 Using magnetic wands purchased at a local children's store for three dollars each, we have had a great time playing matching with the numbers and then even more fun just playing with the magnetic wand and lids on their own. There really is a lot you can do with lids and magnetic wands. I've already started saving some more for future inspiration.